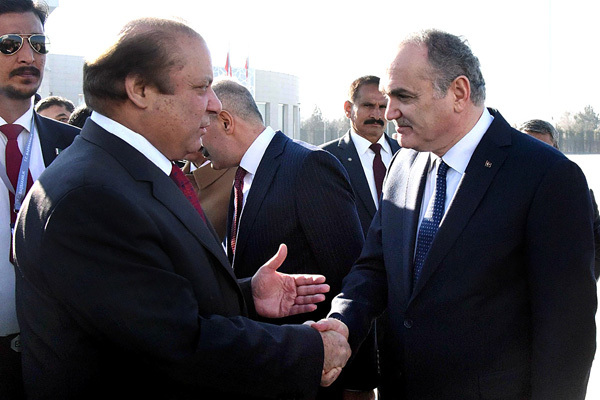 ANKARA Feb 24 (APP): Prime Minister Muhammad Nawaz Sharif on Friday left here for home after concluding his three day official visit. Turkish Minister for Science, Industry and Technology Faruk Ozlu saw off the Prime Minister at the Esenboga Airport. Ambassador of Pakistan to Turkey, Sohail Mahmood was also present. The Prime Minister was accompanied by Begum Kalsoom Nawaz, Minister for Petroleum and Natural Resources Shahid Khaqan Abbasi, Minister for Commerce Khurram Dastagir Khan and PM’s Special Assistant on Foreign Affairs Tariq Fatemi.